Hydropower accounts for over 60% of Canadian electricity generation, making Canada’s electricity grid one of the cleanest and most renewable in the world. The country still has vast untapped hydroelectric potential, more than enough to double the current installed capacity. A number of new hydroelectric generating stations, and national and cross­‐border transmission projects are currently in various stages of development. 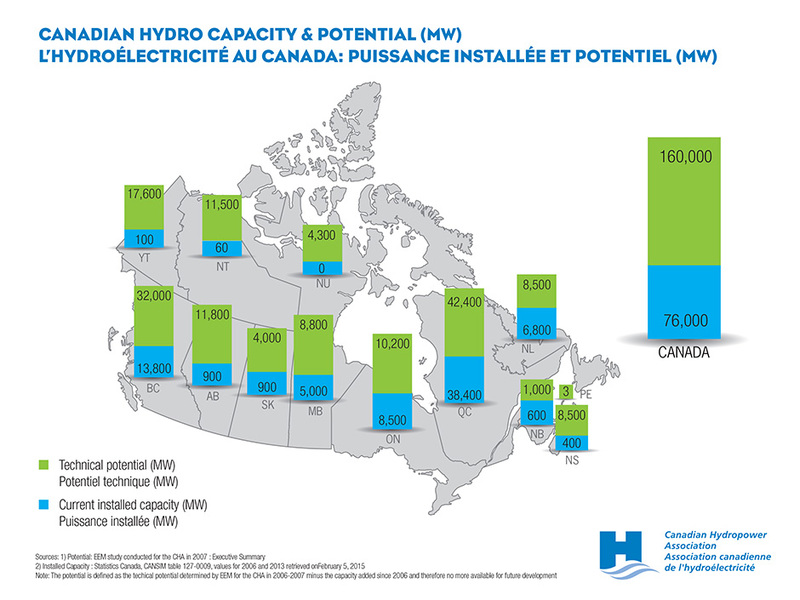 As older sources of generation are retired, Canada’s vast hydropower resources can play an increasing role in meeting growing North American electricity demand and pollution reduction objectives, however more transmission and interconnections will be needed to realize the full benefits of Canadian hydropower. Canada’s electricity grid is one of the cleanest and most renewable in the world. In fact, many countries still rely heavily on fossil fuels to produce their electricity. However, there has been a major upsurge in hydropower development globally in recent years. The total installed capacity has grown by 27% since 2004, with an average growth rate of 3% per year. The rise has been particularly strong in emerging markets where hydropower offers not only clean energy, but also provides water services, energy security and facilitates regional cooperation and economic development. The drivers for the upsurge in hydropower development are the increased demand for electricity, energy storage, flexibility of generation, freshwater management, and climate change mitigation and adaptation solutions. Canada is recognized worldwide as a pioneer and leader in hydropower development and our expertise is valued internationally.